Photo credit: Alivia L. Price. Bar equals 5mm. Parhyale hawaiensis is becoming an established “new model” organism for developmental studies within the arthropods. The great diversity of arthropod body plans, together with our detailed understanding of fruit fly development, make arthropods a premier taxa for examining the evolutionary diversification of developmental patterns, and hence the diversity of extant life. Crustaceans, in particular, show a remarkable range of morphologies and provide a useful outgroup to the insects. 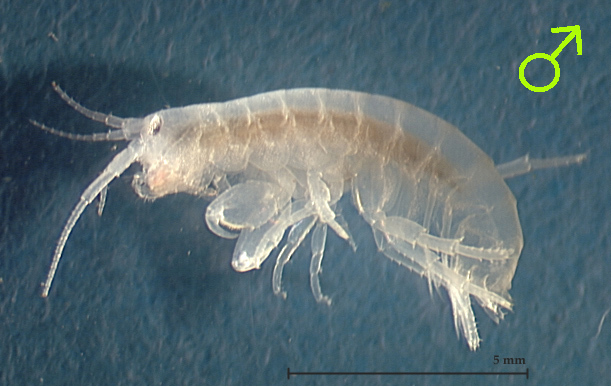 In addition to its phylogenetically strategic position, the amphipod crustacean Parhyale hawaiensis has proven highly amenable to experimental manipulation, is straightforward to rear in the lab, and large numbers of embryos are available year around. A detailed staging system has been developed to characterize the entirety of Parhyale embryogenesis, as well as robust protocols for the collection and fixation of all embryonic stages, in situ hybridization to study mRNA localization, and immunohistochemistry to study protein localization. Established techniques for both the transient and transgenic introduction of recombinant genetic material, together with the availability of endogenous promoters, allow for a variety of gene mis-expression experiments. Targeted knock-downs of gene function are possible using either RNAi or morpholino methods. Directed genome sequencing will generate important data for comparative studies aimed at understanding cis-regulatory evolution. BAC clones containing genes of interest to the developmental and evolutionary biology communities will be targeted for sequencing. An EST database will facilitate discovery of additional developmental genes, broadening our understanding of the genetic controls of body patterning.